Low-Carb Shrimp Salad Cabbage Cups were inspired by the Denny family favorite Shrimp and Macaroni Salad, that I’m always asked to make for the family Super Bowl party! But this tasty treat with similar flavors is low-carb, Keto, low-glycemic, gluten-free, dairy-free, South Beach Diet friendly, and can be Paleo or Whole 30 with the right mayo. Use Appetizers to find more low-carb appetizers like this one. 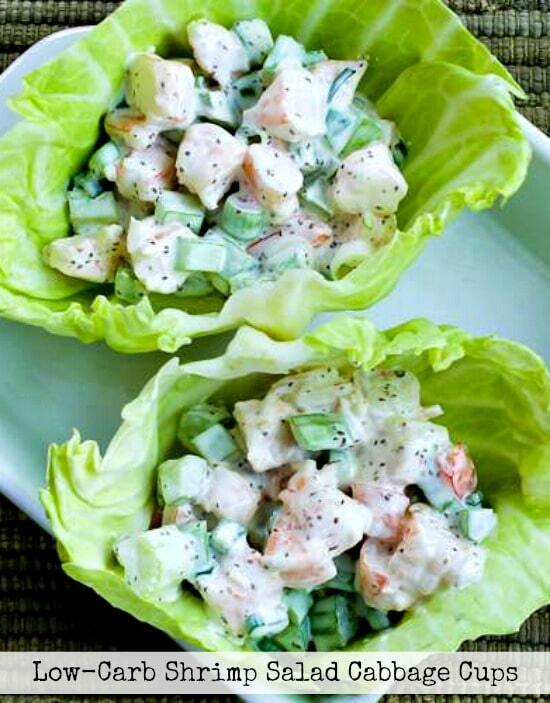 Click here to PIN Low-Carb Shrimp Salad Cabbage Cups! In my family there’s no doubt that Family Favorite Shrimp and Macaroni Salad is the most-requested recipe for our annual Super Bowl Party menu! And that’s guaranteed to be a crowd-pleaser if you’re not so concerned about carbs on Super Bowl Sunday. But a few years ago I came up with these Low-Carb Shrimp Salad Cabbage Cups that use all the tricks that make my Shrimp Salad such a winner, served in a low-carb cups made of cabbage. If you’re wondering about the cabbage, think about how cabbage with mayo dressing is so good on fish tacos, and you’ll see how it can work. 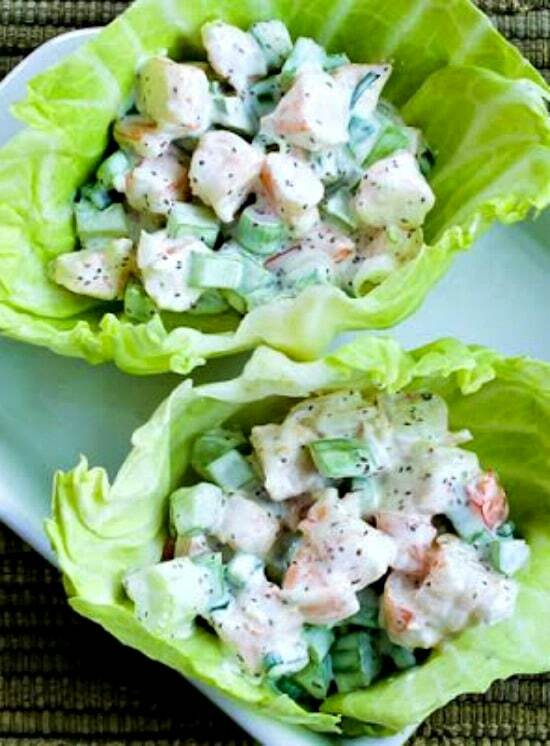 You can also serve these Shrimp Salad Cabbage Cups in lettuce cups if you prefer, or make Shrimp Cocktail Lettuce Cups if you’re more a fan of spicy cocktail sauce than mayo-based dressing on shrimp. And my love of lettuce wraps is pretty well-documented; you can find more recipes like this one in the round-up of Delicious Low-Carb and Keto Wraps with Lettuce, Collards, and Cabbage! And since I first made and photographed these Shrimp Salad Cabbage Cups a few years ago when I had a broken arm, I think it’s safe to say that it’s a super-easy recipe, especially if you buy pre-cooked tail-off frozen shrimp and thaw them overnight in the fridge like I did! Hope you enjoy trying this one! Thaw shrimp in the fridge overnight; then drain and catch the “juice.” Simmer the collected shrimp “juice” until it’s reduced and the flavor is concentrated. Pull the tails off the shrimp. (I only had 3/4 pounds of shrimp, but I wished I’d had more so I’m making the recipe for one pound.) I used kitchen shears to cut the shrimp into small pieces. Finely chop a cup of celery and slice about 1/2 cup green onion. Mix the mayo, concentrated shrimp “juice”, lemon juice, and celery seed to make the dressing. The hardest part of making this with a broken arm was cutting the core out of the cabbage. Use a small, very fresh head of cabbage for best flavor. Carefully pull off whole cabbage leaves to make cups. 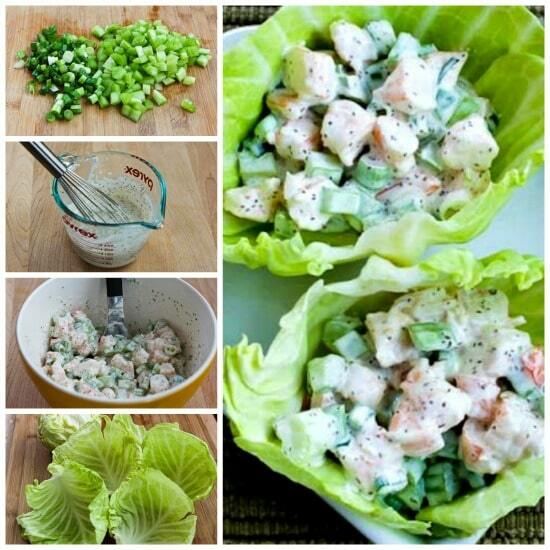 Mix the dressing with the shrimp, celery, and green onion, and fill each cabbage cup with a scoop of the mixture. Yum! More Low-Carb Shrimp to Enjoy! 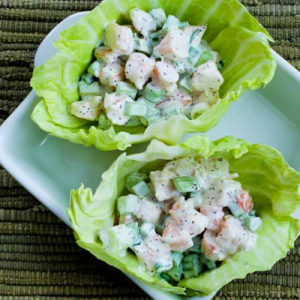 Shrimp Salad Cabbage Cups are a great idea for lunch or game-day food. 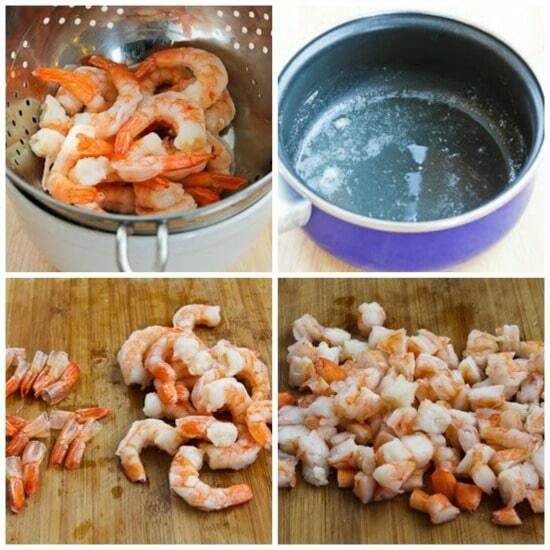 Thaw frozen shrimp in the refrigerator overnight or longer. Put the juice into a small pan and cook over a low simmer until it’s reduced by at least half to concentrate the shrimp flavor. While the shrimp liquid reduces, cut the shrimp into small pieces, chop the celery and thinly slice the green onion. Use a sharp knife to cut the core out of the cabbage and carefully pull off whole cabbage leaves to make cups. When the shrimp liquid has reduced, turn off heat and let it cool a few minutes. Then whisk together the mayo, light mayo, shrimp “juice”, lemon juice, celery seed, salt, and pepper. Fill cabbage cups with a generous scoop of the shrimp mixture and serve right away. The shrimp mixture will keep in the fridge for a day or two if you don’t eat it all at one meal. Shrimp, celery, and cabbage are all great low-carb foods and also perfect for the South Beach Diet. Mayo is a limited food for South Beach, but as long as you use portion control, I would eat Shrimp Salad Cabbage Cups for any phase of the South Beach Diet and it’s also great for most other types of low-carb eating plans.